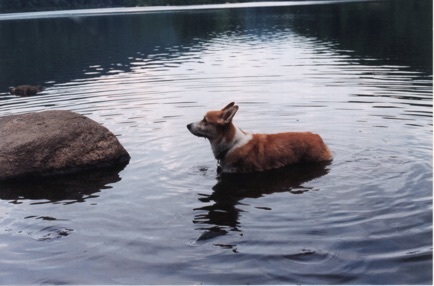 Dylan was our first Corgi, he was born on September 29, 1991 and passed away on May 29, 2005. 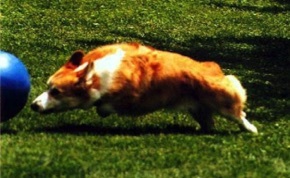 His official AKC name was "Penmorgan's Chelsea Dylan". 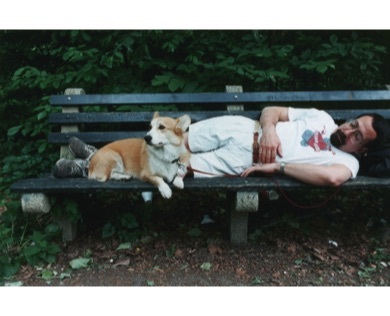 He was named after Dylan Thomas, the famous Welsh poet, who lived for a time at the Chelsea Hotel just down the street from our NYC apartment. Dylan (the dog) spent most of his time guarding the front door, herding us and the neighbors, and watching John work at the computer. He went to tech rehearsals occasionally (Broadway, of course!) and preferred either an orchestra seat with a good view of the stage or a nice large space on top of the tech table.